Why would I need self storage in Sauk Rapids, MN? There are a variety of reasons why you might need self-storage in Sauk Rapids, MN. How much is a storage unit in Sauk Rapids, MN? The cheapest storage unit in Sauk Rapids, MN is $79.00 per month. What size storage units do you have available in Sauk Rapids, MN? In Sauk Rapids, MN we have sizes that range from 5'x10' to 12'x25' to suit your storage needs. How much is it for a 5'x10' storage unit in Sauk Rapids, MN? The cheapest 5'x10' storage unit in Sauk Rapids, MN is $79.00 per month. Sauk Rapids is a small city in Central Minnesota that has seen rapid growth in recent decades. It boasts a comprehensive park system, attractive residential neighborhoods, and numerous annual events and festivals, making it a popular home base for many young families. Just 70 miles northwest of Minneapolis, Sauk Rapids offers small-town appeal only an hour from the big city. Sauk Rapids was first settled around 1850, when a man named W.H. Wood constructed his mansion, Lynwood Terrace, among the oak, maple and basswood forests. 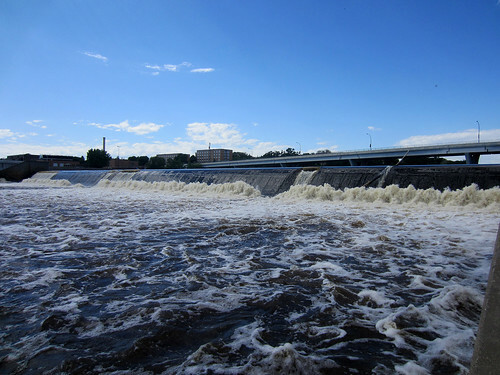 The early residents named the town Sauk Rapids as a nod to the nearby river rapids at the confluence of the Sauk and Mississippi rivers. In the community's early years, a general store, a hotel and a flour mill were the economy's major cornerstones. Shipping gained importance in the late 19th century, as Sauk Rapids became the end of the railroad line and the point from which many area farmers and manufacturers shipped their goods. A catastrophic tornado demolished much of the city in 1886, but Sauk Rapids gradually rebuilt in the decades that followed. Sauk Rapids and the larger Benton County area have a diverse economy with businesses in the construction, manufacturing, health care and education sectors. The county's largest employer is highway and bridge construction company Knife River, while paper mill Verso Paper and printing company Quebecor also provide hundreds of local jobs. Hardwood manufacturer Woodcraft Industries, recreational goods maker Stearns Manufacturing, Sauk Rapids-Rice Public Schools and Country Manor Health round out the major employers in the area. If you're going to be joining the Sauk Rapids job market, you'll find the most job options in the industries of trade and transportation, education, health care, manufacturing and government. Alternatively, it's easy to commute to work in the nearby city of St. Cloud, less than 10 minutes away. There, you can find a variety of jobs in addition to the ones Sauk Rapids has to offer. Students living in Sauk Rapids attend Sauk Rapids-Rice Public Schools. In addition to its traditional campuses, the district also includes an early childhood center, an adult education program and an alternative learning center. Sauk Rapids is a fairly small city, so private school options are limited. However, there's one private Lutheran school, and several more options are in nearby St. Cloud. Utilities: Primary energy providers in the Sauk Rapids area include Xcel Energy and East Central Energy. The city's water department manages water and sewer services. Garbage and Recycling: Sauk Rapids is divided into collection zones, determining trash and recyclables collection days. Trash is collected weekly, while recyclables are picked up every other week. Transportation: The Metro Bus provides fixed-route service in Sauk Rapids as well as transit to neighboring cities like St. Cloud. Pets: All pets must be licensed, and homes are limited to two dogs and four cats. Generally, the most affordable homes in Sauk Rapids are clustered in the city's southwestern corner, near the Mississippi River. The city's largest and priciest homes tend to be either on the waterfront near Wilson Park or inland east of Mayhew Lake Road. Our lowest priced units in Sauk Rapids, MN average $79.00 per month. 67 people have reserved units in Sauk Rapids, MN in the past 30 days. There is 1 location within Sauk Rapids, MN's city limits.